Rhys Height Adjustable & Multi Functional Laptop Stand / Monitor Stand is a desktop solution that customizes & organizes your workstation for sitting or standing and working. The modern design is simple & understated yet extremely functional! Sturdy & modern, it supports computer monitors, small keyboards, laptops, printers, Macbook, Macbook Pro, Large Mac monitors, small TV's and other electronics up to 50 pounds. The adjustable height options raise your monitor or laptop from 5.5 inches to 14 inches with stack-able segments. 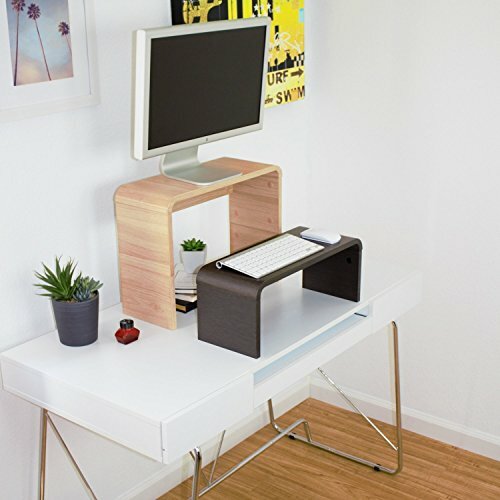 Used for adjusting the height of your monitor, or for standing and working with a laptop, this stand is an ergonomic, versatile do it yourself solution to convert your desk to a standing desk so you are not stuck sitting in front of a computer for hours on end. Great for small work stations, Rhys enables you to add vertical space to your work area by freeing up room underneath your monitor. This modern shelf is multi functional, allowing for numerous practical home and office applications. Dimensions are 18.5" long x 7.5" deep and adjustable to 5.5", 7.5", 10.5", 12" or 14" high. Free Shipping to Lower United States via UPS Ground Shipping. Ships in 1-2 business days arrives within 4-5 business days. If you have any questions about this product by Stand Up Desk Pro, contact us by completing and submitting the form below. If you are looking for a specif part number, please include it with your message.